The full review on Skinner, McStay and Cutler's 2018 season. Dan McStay answers the big questions this week! 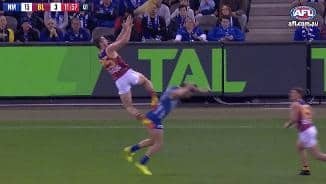 Vote for McStay's hanger for Mark of the Year! 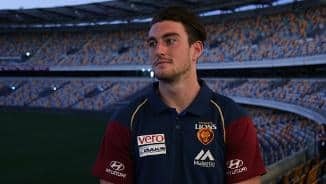 In a similar mould to Geelong's Harry Taylor, Daniel McStay is a tall and athletic defender with a competitive nature. During his years with the Eastern Ranges in the TAC Cup U18 competition, he showed an ability to shut down opposition forwards while providing good counter-attack. • A predominant left-foot defender as a junior, McStay's strong marking ability and versatility was also occasionally put to good use as a lead-up forward. • In his final year in the TAC Cup, he played 16 games and kicked 14 goals for the Eastern Ranges - averaging 10 kicks, 5 handballs and 5 marks. • He injured his elbow on the eve of the 2013 U18 National Championships, but returned to play three games for VIC Metro, playing predominantly down back. • He injured his elbow on the eve of the 2013 U18 National Championships, but returned to play three games for VIC Metro, playing predominantly in defence. 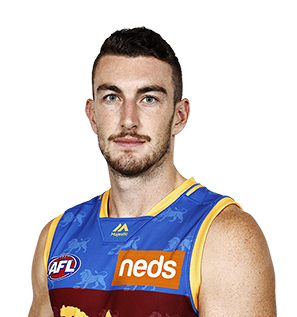 • He attracted plenty of interest from AFL clubs, but eventually landed in Brisbane with Pick No.25 overall at the 2013 AFL National Draft - the same draft his Ranges teammate and close friend Tom Boyd went No.1 to Greater Western Sydney. • A highlight for McStay in 2017 was his nomination for AFL’s Mark of the Year in Round 19, when he soared on top of Melbourne Demons players to claim the ball. • McStay signed on with the Club until at least the end of the 2019 season. • Third year player Daniel McStay’s season was characterised by steady development. • The 21-year-old was strong for the Lions in defence, and was occasionally thrown forward when needed. • He was number 3 for the Club in marks from opposition with 20. • His season came to an end after an ankle break in Round 17 against GWS. • Second year player Daniel McStay’s season was characterised by steady development and a handful of standout performances. • The 20-year-old had two 3 goal hauls and a career best four goals in Round Six against Carlton. • McStay missed two matches with a finger injury, and struggled for consistency at times, as he shifted between playing forward and back as Coach Justin Leppitsch experimented as the Lions struggled with injuries. 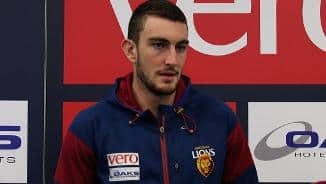 • McStay holds plenty of promise for Lions fans, with his strong marking hands and big-bodied presence suggesting a strong future in the Club’s forward line. • Daniel McStay played in Brisbane’s reserve team for the first half of the year. McStay was moved around on the field and showed he was a versatile player with a promising future with the club. • McStay made his AFL debut this year against North Melbourne in round 15, playing at centre halfback. • Justin Leppitsch described the young defender as an uncovered gem after his magnificent performance in round 19 against Melbourne. He kicked three crucial goals to secure a 23-point win over the Demons. • McStay finished off the year with 9 senior games and averaged an impressive 12 disposals as well as 7 goals.